Well folks I guess its that time again. After quite a long hiatus, I would like to see if anyone would like to see the Customiser Challenge continue on. Chewie currently has quite a few things going on right now, and will be unable to run this on a monthly basis. I have asked his permission to take up the mantle until his return and he has given his blessing. So question one is, does anyone want to continue. Question 2 is if so lets get the suggestions flowing. If we decide to keep this going, September is half over now, we could have the due date be for the end of October. I was thinking about bringing back the self customs idea again soon. Im for that one. That and I already know what head to use. 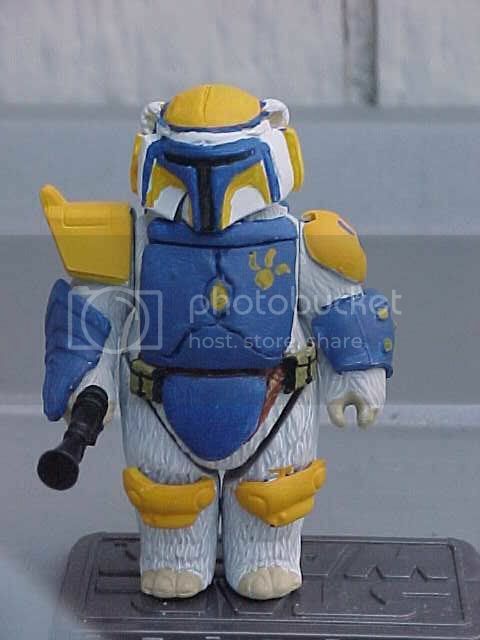 I'd be willing to try some Mandalorians...but I don't want all you guys hiking up prices for VOTC Boba's out there! How about doing some variations using some good old stormtroopers, they have not received as much attention as clones, jedi and mando's in a few years. I also think that stormtroopers would be a good base figure seeing as everyone has an extra stormtrooper to make fodder? still throwing PT-OT bridge figures out there.... anyone up for that? transition stormies, aged obi wan, young luke, early rebel trooper,.... the possibilities are endless. I like early rebels a lot! Maybe we could use some in the UGP. Plus, with all the new soldiers coming out(naboo/endor) there'd be lots of fodder. You know youre right, transition era Rebels are a subject that has NEVER been touched. I say we go for this one, we can kill 2 birds with one stone here and do a project for the UGP as well. I was going to start a seperate thread for a UGP challenge as well on the UGP board. What do you guys think? I'm all for it. Due at the end of October? I think the reason that transition Rebebls have never been touched is simply because there aren't any. The don't exist. The Rebel Alliance wasn't formed until a few years before ANH, so there wasn't any sort of organized resistance. Immediately following ROTS the vast majority of people supported the Empire. It was really only a select few in the Senate that opposed Palpatine and his rule. And at that point it was only political. It takes a siginificant ammount of time to build an underground army, especially one that could even remotely consider challenging the Empire. I hate to be the nay-sayer but I vote against this one. If there were anti-republic planets (seperatist aligned or "neutral") during the clone wars what makes you think all the sudden they would stop putting up a fight after the clone wars? Just because the cowardly leaders of the seperatists were killed doesn't mean the actually people fighting for the cause would be any more cooperative with the republic. Also, it is said that only a select few in the senate make their unhappiness with palpatine known, because during the clone wars being opposed to palpatines regime is considered treason. And last but not least, one of the cutscenes from ROTS was an actual scene of padme having the rebllion explained to her by Mon Mothma and Bail Organa and being asked to join.